This hotel is located in the centre of Villefranche Sur Saone, in the heart of the Beaujolais region. It offers flat-screen TVs and free Wi-Fi internet access. Each guest room at the Kyriad Villefranche Sur Saone is air conditioned, has a private bathroom, and is serviced by a lift. They are spacious and contemporary in style. A buffet breakfast is served every morning. Guests can relax in the bar with a drink, or on the outdoor terrace. Additional facilities at the Kyriad Villefranche include private parking.The Kyriad Villefranche Sur Saone is a 5-minute drive from both Gleizé and Limas. Beauregard is a 10-minute drive away. Newport Hotel Restaurant is 3 km from Villefranche Train Station, just next to the Saône River and the A6. 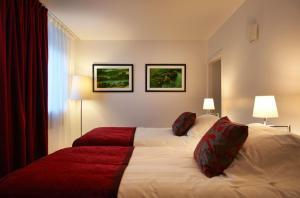 It offers rooms with an LCD TV and free Wi-Fi access. Rooms at Newport Hotel Restaurant offer satellite TV and a telephone. Each has a private bathroom and some are decorated in original wooden paneling. Breakfast is served in the restaurant that features large windows leading onto the terrace. Authentic regional dishes are served throughout the week and the hotel also has a bar. Set in the heart of the Beaujolais region, the hotel is ideally located for wine tasting, cellar tours and sampling regional products. Free private parking is possible on site. Hotel The Liberty’s is located in the heart of Villefranche Sur Saone in the Beaujolais region. It offers en suite, soundproofed rooms with free Wi-Fi internet access. Liberty’s serves a daily buffet breakfast and its restaurant serves traditional French cuisine. Guests can try a selection of beers and whiskeys at the on-site Irish pub. 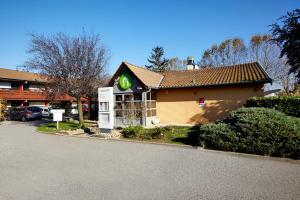 The Liberty’s is 300 metres from the SNCF train station and has easy access to the A6 motorway. Lyon Saint-Exupery Airport is 50 km away. All accommodation types at Mercure Villefranche are serviced by a lift and feature air conditioning, a flat-screen TV with cable channels and wooden floors. A private bathroom is provided and interconnecting rooms are available for families and groups of friends. A full buffet breakfast can be enjoyed every morning and guests can try gastronomic cuisine at Le Belooga, the hotel’s restaurant. Cocktails are served at the bar or on the terrace. Located in the Beaujolais region, this property is a 5-minute walk from Notre-Dame des Marais Cathedral. Private parking is available on site at an extra cost. Located in the heart of Villefranche-sur-Saone, Beaujolais Home offers a self-catering house with a terrace and small garden. The Beaujolais hills are within a 15-minute drive of the property. The holiday home features a living room with a TV and DVD player, a washing machine, 3 bedrooms and a bathroom. The kitchen includes an oven, dishwasher and microwave. Supermarkets and restaurants can be found 300 metres away and there is a local market 4 days a week. A dance themed stay can be arranged and lessons are given by the owners, who are professional dancers. 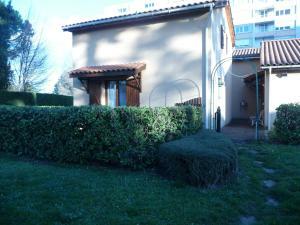 Vineyards are only 0.5 km away and the A6 motorway is ideally located 1.5 km from the property. Free private parking is possible for 2 vehicles on site. Ideally located in Villefranche-sur-Saône’s city centre, the Best Western Plaisance offers a privileged location from which guests can explore and enjoy the picturesque Beaujolais region. Rooms and suites at the Best Western Plaisance are individually decorated and present comfortable and cosy living spaces. They feature all of the necessary amenities including free Wi-Fi access, minibar and flat-screen TV. To get off to a good start, the copious buffet breakfast is served daily in the warm and cosy breakfast room. The hotel bar lounge presents a contemporary setting and offers a warm atmosphere for a relaxing drink. It features a large choice of Beaujolais wines, champagne and various drinks. Close to the Saône River, the Campanile Villefranche-Sur-Saône is easily accessible by car as it is conveniently located just off the A6 motorway. The Campanile Villefranche-Sur-Saône offers a warm welcome, excellent value for money and functional accommodation. This Campanile presents the ideal backdrop for a stopover when travelling through the Rhône-Alpes region. This family friendly hotel features its own restaurant, serving breakfast, lunch and dinner. Housed in a former monastery, L’Hostellerie la Ferme du Poulet is 2 km from the centre of Villefrance-sur-Saône. It offers free Wi-Fi access, a terrace and a garden. Free private parking is available. Offering garden views, all the air-conditioned rooms include a seating area, a flat-screen TV with satellite channels and a wardrobe. The private bathroom is complete with a bath and a hairdryer. Guests can enjoy a continental breakfast every morning in the restaurant or in the comfort of their rooms. The hotel’s restaurant serves gastronomic cuisine and Beaujolais wine. A bar is also available. L’Hostellerie la Ferme du Poulet is 5 km from the Beaujolais vineyards and 1 km from the Paul Dini Museum. Lyon Saint-Exupéry Airport is 30 km away. Hôtel balladins Villefranche-Sur-Saone Pte de Lyon is located in Villefranche-sur-Saone, 2.7 km from the Train Station. It offers free Wi-Fi access and a furnished terrace. Each air-conditioned room is in a simple decor. They are equipped with a flat-screen TV and a private bathroom. Closed secure parking is provided at the Hôtel balladins Villefranche-Sur-Saone Pte de Lyon. It is linked to motorway A6, which gives direct access to Lyon at 27 km away.